Kim Gunderson-Moore stood outside the nursery window watching the two doctors examining her newborn son. The day before, when she first laid eyes on Cameron, she thought he might have Down syndrome. She asked the family practitioner who delivered him to bring in a pediatrician to check. As the family practitioner came down the hall to talk to her, she already knew what he was going to say. He sat on the bed next to her, broke the news and told her he was sorry. “This kind of thing can be hard on a marriage,” she recalls him saying, before he left to complete his rounds. Sitting alone on the bed with her thoughts, she worried about what she knew about Down syndrome, how people with the condition had a shorter life span and how her son’s life would be different. “I jumped ahead to all those worries instead of just totally soaking in this beautiful baby boy,” she said. Later that morning, the pediatrician stopped by her room to congratulate her roommate on her healthy baby boy. He looked at Moore and walked out without saying a word. The message, delivered nearly 28 years ago, was quite clear: Their life would be so difficult, it could ruin their marriage. They should be prepared for a tough life filled with heartbreak and sorrow. A baby born with a disability was not to be celebrated and should be spoken of in hushed tones. It’s a message still heard today by thousands of parents of children with disabilities — temper your expectations so you won’t be disappointed. Research suggests quite the opposite. When parents have high expectations for their children with disabilities, those children are more likely to reach their full potential. They are more likely to complete their schooling, live independently and earn a living wage. Increasingly, parents of children with disabilities are learning to ignore the negative messaging about their children’s limitations to focus instead on what their children can achieve. Children with developmental disabilities were once routinely institutionalized, hidden away from public view as much for society’s own comfort as for their own personal safety. By the 1960s, parents started rebelling against the push to send their children away, hiding them at home instead. In the 1980s, horror stories about state hospitals led parents to openly advocate for keeping their children in the community. Well-meaning advocates built hundreds of group homes and sheltered workplaces, where people with disabilities could live and work, segregated from the world around them. Since the turn of the century, however, those too have fallen out of favor as parents look for ways to keep their children at home and to integrate them into their communities. Now only 1 in 4 people with disabilities receive publicly funded long-term care services. That has left many parents fighting for inclusion, striving to provide their children with the same opportunities any typical child would get: a chance to go to school with their peers, to find meaning in their lives, and to live independently and realize their full potential whatever that might be. It’s a difficult road fraught with pitfalls and challenges, and one parents walk willingly to secure a better future for their children. They are learning to dream big to avoid limiting what their children could achieve. Silvia and Mark Bundy had a son, Alex, in Portland in 1992. After he was diagnosed with Down syndrome, a nurse came by to show Silvia Bundy a graduation picture of her brother, who also had Down syndrome. Reality didn’t set in until Alex started missing milestones at 3 months old. Month by month, year by year, they fall further behind. Bundy came to refer to her son as her extremist. There was always extreme sadness followed by extreme joy. Things that parents might take for granted become major enterprises for families experiencing disability. When Alex needed to go to the dentist for the first time, he screamed inconsolably. The dentist understood and had Bundy bring him back week after week. He practiced sitting in the chair, having his cheek rubbed, desensitizing him to the process of dental hygiene, until he finally allowed the dentist to check his teeth. The first time they flew to visit his grandparents, the Bundys prepped everybody on the flight from the pilot to the flight attendants. They were the last to board the plane. They arranged for his grandparents to be on the tarmac. Alex screamed through much of the flight, until his father told him the plane was going down. “Down?” Alex exclaimed with joy, and the entire plane erupted in applause. Bundy works for the Alyce Hatch Center, the region’s early intervention program that provides services and support to children who miss developmental milestones early in life. She started working there, when Alex was attending therapy at the center. Despite the challenges, Alex worked his way through high school and graduated with a modified diploma. After high school, he completed a transitional program that was to prepare him for life on his own. Now he volunteers at a public library and an education center, and lives independently in a Bend house with five other roommates, all of whom have a disability. He thrives on routine, which helps him live independently. When unforeseen things arise or the routine has to change, Bundy must step in to ensure nothing falls through the cracks. Erik Carter, a special education researcher at Vanderbilt University, led a study in 2012 tracking more than 11,000 students across 13 special education categories. The researchers wanted to know which student, family, school or community characteristics would predict whether students with significant disabilities would find jobs after graduating high school. They found that when parents had definite expectations at the start of high school that their children would eventually be employed, those children were five times more likely to work for pay in the first two years after graduating. Parental expectations were a stronger predictor than any other factor they examined. Other researchers found that parental expectations predicted not only whether their children would work after high school, but whether they would graduate or even be enrolled in school. Carter explained that when parents expected more from their children from their earliest days, parents would expose their children to different types of activities and experiences. They were more likely to require their children to do household chores, to talk to them about their future, to sign them up for extracurricular activities and to advocate for rigorous learning experiences in school. Those activities and experiences served to help children realize a different future and provide parents with a glimpse of what might be possible with the right encouragement and support. Parents, he argued, needed to see more examples of people with disabilities going to work or attending college. Yet, jobs for those with disabilities often tended to be hidden from view, in back rooms or sheltered workshops. That, he said, is how the field has always moved forward fastest. For families like the Moores, early intervention programs for kids who miss development milestones serve as a soft landing during a child’s early years. Those programs are geared to the children’s specific needs and increasingly offer children with disabilities a chance to interact with and learn from typically developing kids. When Cameron reached kindergarten age, Kim and Paul Moore faced the same limited perceptions of what their son could handle. In the mid 1990s, school officials were starting to talk about inclusion, and children with disabilities were largely segregated in special education or life skills classes. District officials wanted to place Cameron in a special education program in Redmond. The Moores wanted him to go to school in Tumalo with his older brother and sister. “That was quite a challenge to sit around a table with so many people that were pushing us in another direction,” Moore recalled. She had worked as an interpreter for deaf children in schools and had sat through similar meeting on the other side of the table. Now she was the parent fighting for her child. School district officials were concerned about the added burden on Cameron’s teachers. The Moores had an ace up their sleeve. Cameron never developed speech, and while other parents had turned to computer technology to help their nonverbal kids, Moore taught him sign language. They were able to get Cameron a signing assistant and that meant the teacher would have help. When Cameron graduated from high school he attended a transitions program, designed to help acclimate him to life after school. The Moores were disappointed to see it focused more on preparing him for working in sheltered workshops than out in the community. One of his first jobs was to sit all day and feed paper into a shredder. From there, he was moved to a thrift store, where he worked in the back room hanging up clothing. “For some of the adults there, it was a good fit, but not for Cameron,” Moore said. The solution came when his older brother, Aaron started to work part time with Cameron. As a musician, Aaron worked evenings, and sometimes Cameron would serve as the band’s roadie, helping them unload their equipment and set up on stage. That left his days free to work with Cameron. He was hired as his brother’s community access worker. They now volunteer together at the Habitat for Humanity ReStore, and work at the ReptileZone in Bend. Moore’s husband died from ALS earlier this year, leaving her and Aaron to care for Cameron. Many parents struggle with the challenges of constantly having to fight for their children, to advocate for inclusion and for the same opportunities that parents of typical children take for granted. Children with disabilities rarely get invited to birthday parties. They can’t go to the grocery store without getting dirty looks. As people walk on egg shells around them, worried about saying the wrong thing or trying to console parents about their child’s disability, parents feel like they can’t celebrate their newborn child or any of their child’s accomplishments. It wasn’t until Quinn found other parents of children with Down syndrome that she started to see what was possible for her son, Colton. “It’s hard to get answers to stuff when you don’t really know what to ask,” she said. Studies suggest that being a parent of a child with developmental disabilities or complex medical needs takes a huge toll on their physical and mental health. They are more likely to be diagnosed with depression than parents with typical children, and are more likely to endure physical problems such as lower back pain. One study found that 23 percent of parents of children with disabilities had their own physical limitations compared to 11 percent of parents of typical children. The burden falls disproportionately on mothers, who studies show, are generally more likely to be the primary caregiver for children with disabilities. That holds true even when children are grown up, mothers work full time and when fathers have retired. As a result, mothers are more likely to rate their health as poor and to show the cognitive effects of long term stress. While the shift from institutional care to outpatient community and home-based services has been a boon for children with disabilities, it has put more pressure on their parents. They must become experts in medical care and learn to navigate the complex world of social services. Their child’s life can sometimes revolve around doctor visits and therapy appointments, instead of soccer practice and playdates. Kackley decided Mia could learn a lot from interacting with typical children, hearing how they talk and watching how they play. She felt that was as important as many of the specialized services for children with disabilities. Kackley works for the Central Oregon Disability Support Network, an organization run by parents of children with disabilities, that stresses peer support over specialized services. Dianna Hansen, the support network’s executive director, has a 15-year-old daughter with Down syndrome. Victoria dreams of being a chef and living in a house with a bowling alley and a lap pool, and driving a red car, either a convertible or pickup truck in case she needs to tow a horse trailer. A few years ago, she decided she didn’t want to go to physical therapy anymore. After all, none of her friends at school had to go to therapy. The Hansens consulted with their physical therapist to learn what kind of activities Victoria could do strengthen her core. They got her into horse riding and other activities that were more like the things her friends were doing. Victoria rock climbs and kayaks. During the winter, she skis every Sunday. She plays drums in the school band, and during summer, goes to percussion camps. “Anything you can think of, she’ll sign up for,” Hansen said. At times, those running the activities hesitate when they hear the words Down syndrome. Once they meet Victoria and learn more about her abilities, it’s rarely a problem. Hansen started the education process early on. 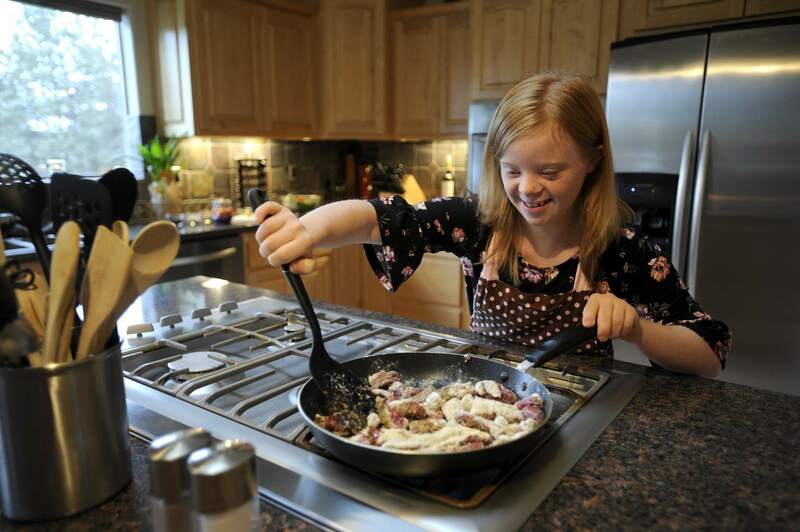 When Victoria was born at St. Charles Bend in 2003, the staff handed her some photocopied pages about Down syndrome. She wouldn’t live past 26, and wouldn’t dress herself until she was 7, the materials said. It was only weeks later that her husband noticed the pages dated from 1966. Hansen said it was seeing other kids with disabilities doing amazing things that taught her to never hold her daughter back. Nobody calls a co-worker “Hysterectomy Lori” or “Cancer Sue,” shesaid. In fact, people with disability remain the only group identified solely by what they cannot do. Groups like the disability support network are now encouraging parents not to limit their expectations for their children, to avoid artificial ceilings on what they can do with their lives. When a child’s support system has big dreams and teaches that child to have those big dreams for herself, she said, that’s will have a profound impact on their lives. That sort of thinking has led to an emerging approach by support groups to advocate for people with disabilities to live whole lives. Dunn, whose son has Down syndrome, recalls having coffee several years ago with two other moms of children with disabilities, talking about what their children would do for the summer. Both moms talked of therapy appointments and other services, rattling of a long list of activities and a very busy schedule. Then Dunn said her son was going to summer camp. Dunn said it’s hard for many children to escape that focus on what they can’t do and what needs to be fixed, because that’s what most doctors, teachers and others in the community talk about. Some counter that having high expectations could leave parents and their children at risk of being disappointed. Dunn doesn’t believe that expectations can ever be too high. She gives the example of when her son had a crush on Molly, the captain of his high school’s volleyball team. Worried her son might have his heart broken, she asked her circle of friends whether she should have talk with him about the unlikelihood of a dating relationship with Molly. “All the men in the group laughed at me,” she said. No, we all shoot for a Molly, they told her, and then we recalibrate. Dunn’s son is now 26, lives in his own condo, uses mass transit by himself, and has worked in the community for three years. That’s not to say that big dreams make life any easier. Parents face numerous challenges in getting their children the help they need along the way. Wages for personal care workers remain low, making it hard to find qualified help. “It’s very hard to find and keep people that can do that work, which sort of leads to a revolving door of strangers in and out of your child’s life,’ said Carrie Salehiamin, a Portland mother of a 15-year-old girl with developmental disabilities, and a volunteer with FACTS Oregon. Access to therapists is often limited, particularly in rural areas of the state, and even when those professionals are available, insurance plans often limit the number of therapy appointments or set annual caps on reimbursement. There are hidden costs that insurance won’t cover. Her daughter is unable to tolerate dental procedures unless she’s fully sedated. Parenting is a challenge with any child, and certainly, all families face their struggles from time to time. For families of children with disabilities, those challenges get taken to the extreme. That often leads to a perception on the behalf of parents that it’s them against the world, that no one else can care for their child but them. Reynolds has a child and a brother with disabilities. Researchers like Reynolds are still studying how to help parents avoid that spiral of negativity, that leads to further isolation, and helping them to focus on their child’s strengths instead. Disability advocates are now trying to reframe the discussion from a strength-based perspective, to support families as they try to envision a fulfilling whole life for their children. That could take retraining expectations of the general public as well. Reynolds said there is now a big push to train doctors to treat children experiencing disability the same way they treat their other patients. And parents need to see more role models for their kids, the people with disabilities who are living life to their fullest potential. Advice to parents often focuses on what services they can use, she said. Go get occupational therapy. Take him to physical therapy. Have you signed her up for Social Security? Life experiences, she said, are the key to the expectations component. That applies even for the children with the most profound disabilities. Are they a ray of sunshine for someone else? What makes their eyes twinkle? Maybe they don’t have words to communicate, but they still have a value.